On October 14th 1962, an American U-2 spy plane completed a relatively routine run over the island of Cuba, taking reconnaissance photographs (see picture) from an altitude of 12 miles. 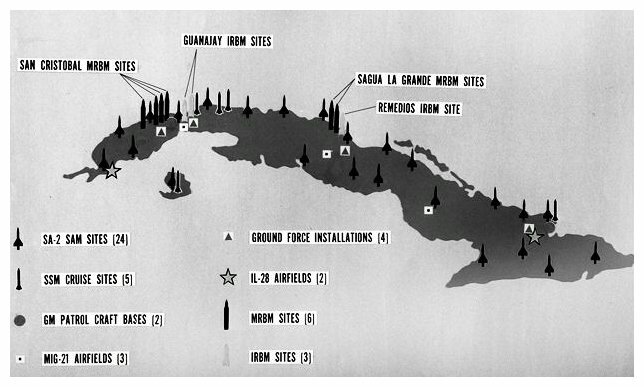 When the film was developed it revealed evidence of missiles being assembled and erected on Cuban soil. CIA and military analysts identified them as Soviet medium-range ballistic missiles, capable of carrying nuclear warheads. The presence of these weapons in neighbouring Cuba meant the Soviets could launch attacks on locations in the southern and eastern United States. This would give the Soviet Union a first-strike capacity, giving cities like Washington DC, New York and Philadelphia just a few minutes’ warning. President John F. Kennedy was briefed about the missiles four days later (October 18th). By the end of the day, Kennedy had formed an ‘executive committee’ (EXCOMM), a 13-man team to monitor and assess the situation and formulate response options. 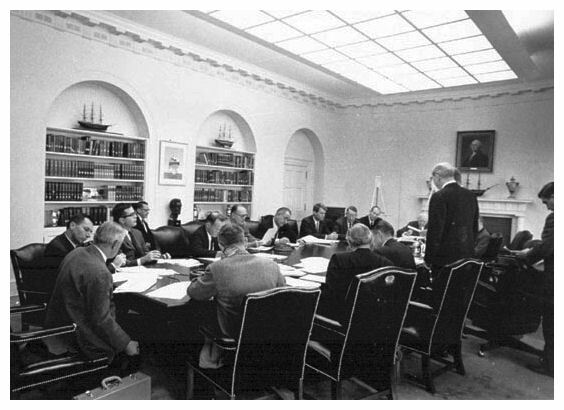 EXCOMM’s members included vice-president Lyndon Johnson, Kennedy’s brother Robert, defence secretary Robert McNamara and other advisors from the military and Department of State. Over the next few days, Kennedy and EXCOMM weighed their options. They agreed that the US could not tolerate the presence of Soviet missiles in Cuba. Diplomatic pressure on the Soviets to withdraw the missiles was also ruled out. Advice from EXCOMM suggested the Soviets would respond poorly to belligerent language or actions. An offer of exchange, such as the withdrawal or dismantling of US missile bases in Europe, might make the Kennedy administration appear weak, handing the Russians a propaganda victory. Kennedy’s military hierarchs recommended an airstrike to destroy the missiles, followed by a ground invasion of Cuba to eliminate Fidel Castro and his regime. But Kennedy – now more wary of military advice since the failed Bay of Pigs invasion of Cuba – wanted to avoid a military confrontation with the Soviet Union. Instead, he authorised a naval blockade of the island. The US would draw a firm line around Cuba while seeking to avoid hostile action that risked triggering a nuclear war. 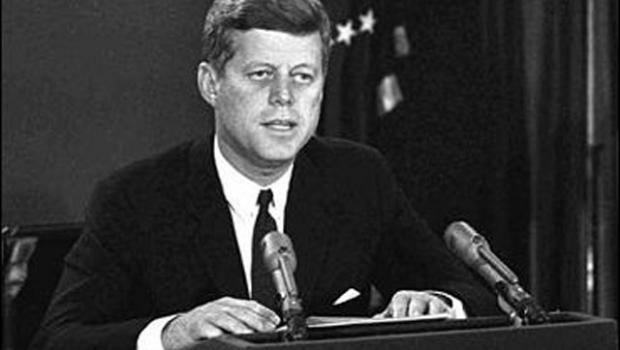 On October 22nd, Kennedy addressed the nation by television, announcing a “quarantine” of the Cuban island. He also said his administration would regard any missile attack launched from Cuba as an attack by the USSR, necessitating a full retaliatory response. Soviet leader Nikita Khrushchev described Kennedy’s quarantine as a “pirate action” and informed Kennedy by telegram that Soviet ships would ignore it. Kennedy reminded Khrushchev that the presence of Soviet missiles in Cuba breached an earlier promise by the Soviet government. US Navy warships initiated their quarantine of Cuba. They allowed some small freighters through but stopped larger vessels for inspection, finding no military equipment. Meanwhile, American U-2s continued their missions over Cuba, flying every two hours. These overflights reported no pause or slow-down in the assembly of Soviet missiles. There was no change in the situation after four days of quarantine. Kennedy came under pressure from his generals, who urged an airstrike to destroy the missiles before they became operational. At this point, a military confrontation between the US and USSR seemed almost inevitable, generating fear about a possible nuclear exchange. All levels of government hastily organised civil defence measures such as public bomb shelters; in most cases, these were capable of sheltering barely one-third of the population. Some citizens constructed their own shelters and stockpiled tinned food and other necessities. Many gathered in prayer in their local churches. Others packed up their belongings and took extended vacations with family members in remote areas where nuclear missiles were less likely to fall. In Soviet Russia, press censorship meant that most citizens were largely unaware of the crisis unfolding in the Caribbean. The stalemate was broken by a series of developments across two days. On October 25th Adlai Stevenson, the US ambassador to the United Nations, confronted the Soviet ambassador in the Security Council with photographic evidence of the Cuban missiles. Given their previous denials, this publicly exposed Soviet dishonesty during the crisis. Around this time the White House also received a backroom offer to resolve the crisis, passed to a Washington reporter by a Soviet agent. On October 26th, the US State Department received a long, rambling letter, purportedly from Khrushchev. This letter promised to withdraw the Cuban missiles, provided the US pledged to never attack or invade Cuba. A follow-up message proposed a more direct exchange: the removal of the Cuban missiles, in return for the removal of American Jupiter missiles from Turkey and Italy. Kennedy agreed to this, provided the deal was not made public. The arrangement was finalised on the evening of October 27th, though it almost fell through after an American U-2 was shot down over Cuba by a Soviet surface-to-air missile. Kennedy resisted considerable pressure from his generals to retaliate. It later emerged the Soviets in Cuba had fired on the U-2 without authorisation from Moscow. The Cuban missile crisis was arguably the ‘hottest’ point of the Cold War, the closest the world has come to nuclear destruction. As US Secretary of State Dean Rusk noted toward the end of the crisis, “We were eyeball to eyeball and the other guy just blinked”. Information revealed years later suggested that the crisis could easily have deteriorated into a nuclear exchange. Soviet officers in Cuba were equipped with about 100 tactical nuclear weapons – and the authority to use them if attacked. Castro, convinced that an American invasion was imminent, urged both Khrushchev and Soviet commanders in Cuba to launch a pre-emptive strike against the US. And during the naval quarantine, a US destroyer dropped depth charges on a Soviet submarine which, unbeknownst to the Americans, was armed with a 15 kiloton nuclear missile and authority to use it. Given that several Soviet officers were authorised to fire nuclear weapons of their own accord, Kennedy’s delicate handling of the situation seems judicious. In the wake of the crisis, the Soviets reorganised their command structure and nuclear launch protocols, while the White House and Kremlin installed a ‘hotline’ to ensure direct communication in the event of a similar emergency. 1. The Cuban missile crisis unfolded in October 1962, following the discovery by US spy planes of Soviet missile sites being installed on nearby Cuba. 2. Missiles in Cuba gave the Soviet Union a ‘first-strike’ capacity. Unwilling to tolerate this, President Kennedy formed a committee to orchestrate their removal. 3. Considering all options from diplomatic pressure to an airstrike or invasion, EXCOMM settled on a naval “quarantine” of all Soviet ships sailing to Cuba. 4. The Cuban crisis and the US blockade carried a significant risk of military confrontation between the US and USSR, with the consequent risk of nuclear war. 5. The crisis was eventually resolved through a secret deal, in which the Soviets withdrew the Cuban missiles in return for the withdrawal of American Jupiter missiles from Turkey and Italy. 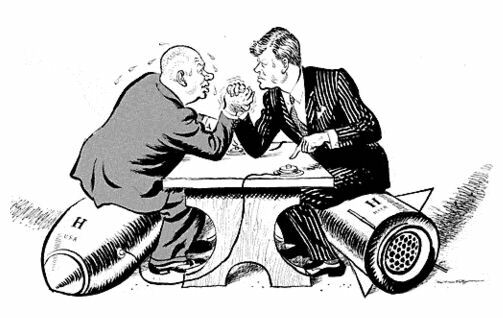 J. Llewellyn et al, “The Cuban missile crisis”, Alpha History, accessed [today’s date], https://alphahistory.com/coldwar/cuban-missile-crisis/.